The Borg el Arab Airport is a public airport located about 40 kilometers to the south-west of Alexandria City in the north-central region of the North African Arab Republic of Egypt. Owned and operated by the government of Egypt this airport is serving the requirements of the city of Alexandria and the nearby areas of the Nile Delta. Established, so as to become the principal airport for Alexandria, especially during the period when the Alexandria International Airport would be shut down for major renovation. Situated at an elevation of 177 feet above mean sea level, the Borg El Arab Airport with most modern facilities was recently inaugurated in the year 2010. The newly constructed passenger terminal building designed in the shape of a boat contains a duty free shop, a franchise food court, travel offices and related services with four movable gates directly connecting with the aircrafts. Apart from 11,156 feet long asphalt surfaced main runway, 2 other asphalt runways measuring 1,347 feet are serving for aircraft flights. There is a huge parking area in front of main terminal building which can accommodate 350 vehicles at any given time. Private taxi services are available from here to Alexandria City, but passengers should beware as these services are not regulated. It would be wise to always ensure on a fare before embarking as most taxi drivers take advantage of foreign visitors by setting unrealistic high fares. With a capacity to handle 1.2 million passengers per year, the Borg El Arab Airport will comfortably be able to absorb the flights diverted from the Alexandria International Airport while the latter is undergoing renovation. 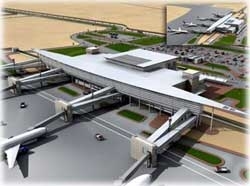 Here's the our members favorite photos of "Airports in Alexandria". Upload your photo of Borg El Arab Airport!